【VARIABLE CONTENT FOR MORE ENTERTAINMENT】Our sand toys box consists of 14 different colorful molds including a truck to carry sand, a sand shovel and a rake for digging, a water tank and a bucket for water, a large sand wheel, and 8 different mold sculptures that allow your kids to play on the beach for hours without getting bored. 【LEARN WHILE HAVING FUN】Playing with sand is absolutely your toddler's favorite activity this summer. That's why our beach toys are designed to guarantee a combination of education and entertainment. Creating and building with all the molds and tools will get the toddler's imagination to float up in the sky. The marine bio-molds get children to recognize nature. 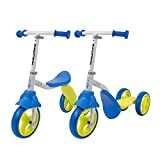 The tool molds boosts the toddlers ability to exercise. 【BEST SUMMER GIFT FOR KIDS】Beach toys are an essential gift for children during this summer. We have exquisite color boxes to ensure that the delivered products are not damaged, other than the large-capacity mesh backpack. Your children can enjoy summer fun by carrying beach toys to sand beach, sand box, bathtub, pool, yard or park. Our beach toys provide your kids with loads of fun for unforgettable memories! 【SAFE AND DURABLE】HiDreammy beach sand toys are made up of natural soft silicone material (BPA Free), and tested not to deform under 10000 compression test. Our beach sand toys are more concerned with the safety of children compared to other products. Their surface has a soft and smooth feeling like baby's skin. Their rounded edges prevent the hazard of cuts and scratches that children might get with other pointed-edges products. Our beach toys have all the characteristics parents care about. 【POSITIVE PARENT-CHILD INTERACTION】Surely during the first years of life, the parent-child interaction is one of the major requirements for a healthy emotional and social development. Regarding this, our beach toys were designed to give parents positive interactions with their children allowing both of them to dig traps, play sand wheel, and create creative shapes and sculptures. After all, children need your companionship before anything else. Our beach toys allow you to enjoy family fun. It’s Summer Time! Hoorays! Are you ready for the beach? Oh oh! You didn’t get your beach toys yet? Don’t worry my friend, you’re about to purchase the most wonderful set out there! to see new possibilities, and offer countless ways to play. 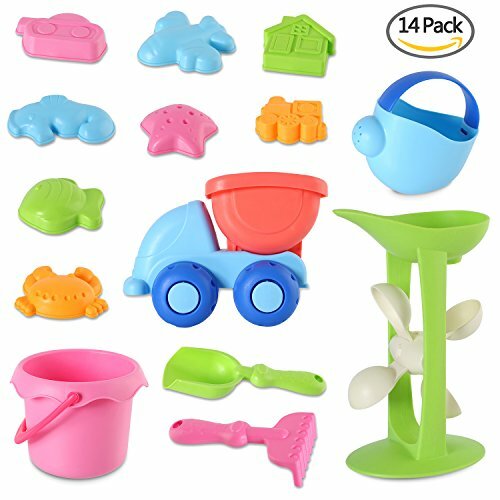 HiDreammy Beach Sand Toys for Toddlers and Kids (14 pieces). A Safe, Durable and Foldable Sand Toys Box Made up of Natural Silicone Material (BPA Free). - Truck: 6.2" * 4.8"
- Kettle: 5.5" * 4.9"
- Large Bucket with handle: 5.6" * 3.9"
- Sand Shovel: 3.1" * 8.2"
- Sand Rake: 3.5" * 6.4"
- Large sand wheel: 4.5" * 7.2"
- Starfish Mold: 4" * 4"
- Lemon Fish Mold: 4" * 4"
- Seahorse Mold: 4" * 4"
- Crab Mold: 4" * 4"
- Castle Mold: 4" * 4"
- Train Mold: 4" * 4"
- Airplane Mold: 4" * 4"
- Tank Mold: 4" * 4"
strict quality standards to offer you the best customer experience. Feel free to contact us for any details or issues. In addition to that, ALL HiDreammy Items include LIFETIME WARRANTY! So do not hesitate and add it right now to your cart. What are you waiting for? LET’S ENJOY SUMMER’S SUN WITH LOADS OF FUN!